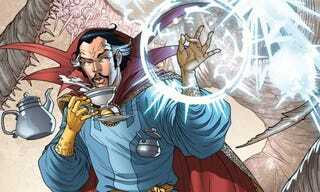 Marvel Studios is negotiating with Jon Spaihts to write the script for Doctor Strange. And not to leap to conclusions (but to absolutely leap to conclusions), but do we really trust one of the Prometheus writers to produce a good script for this? Spaihts has a relatively short filmography, starting with 2011 The Darkest Hour (which didn't do well). From there, he wrote a well-received-but-never-produced Passengers. Then he hooked up with Damon Lindelof to write Prometheus, when the script is one of the most-derided parts of that film. His latest project is the Mummy reboot, which is being produced by Alex Kurtzman and Roberto Orci. And we think you know how we felt about their Star Trek Into Darkness. These are names — when connected to major franchises — that make me nervous. Maybe it's totally unfair to tar Spaihts with my feelings about Lindelof, Kurtzman, and Orci's past mistakes. Especially since they've also done things I've liked. But, I don't know, I'm still afeared. On the other hand, this reaction from Spaihts is totally charming. And Marvel's done this right more often then they've done this wrong. We'll see. Fingers crossed.